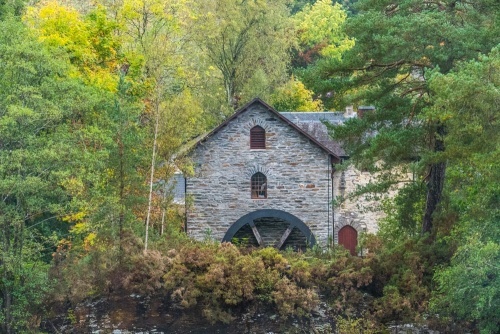 Set in a historic former tweed mill overlooking the Falls of Dochart, the Breadalbane Folklore Centre hosts displays local and clan history, St Fillan's healing stones and Scottish folklore. The exhibition on St Fillan is particularly fascinating. One of the historical highlights is the mill building that houses the Heritage Centre itself. This three-storey high former tweed mill is just the latest in a long series of mills on this spot, though the earlier mills were built to grind meal. The first of the meal mills was said to have established by St Fillan himself. 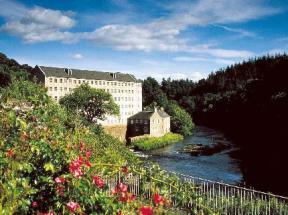 The present mill was built around 1840 by the 2nd Marquis of Breadalbane. According to a longstanding tradition the mill was never used on 9 January, St Fillan's feast day. After it ceased to be a tweed mill it was used as a shop for selling woollen goods. The mill retains its waterwheel, which can be seen around the back of the building over a channel bringing water from the River Dochart. One display our family very much enjoyed explored the story of St Fillan. According to legend, Fillan was building a church in Glen Dochart when a wolf killed the ox that Fillan was using to pull his cart. Fillan persuaded the wolf that his actions were wrong and the wolf agreed to pull Fillan's cart and plough for him. Another version of the story says that Fillan used the power of prayer to calm the wolf and yoke it to his plough. Outside the Heritage Centre entrance is a large silvered sculpture of a wolf, illustrating this story. This set of eight smooth stones were said to have been used by St Fillan to cure various ailments. Each stone is shaped like the organ it is supposed to heal (for example, there is a liver-shaped stone for healing liver complaints). The stones were used to rub on the ailing part of the ill person. The healing stones have been kept in the mill long before it was a heritage centre. The stones are kept safely in a niche cut into the first-floor wall of the mill and are available for healing purposes by arrangement. Also available is the key to the Clan MacNab burial ground on Inchbuie Island, halfway across the Bridge of Dochart. The Centre was forced to close in 2011 due to budget cuts. However, local people were determined to keep the Centre operating, and it has now reopened with a thrift shop on the ground floor and an arts and craft shop above. The centre is completely run by local volunteers, who are planning to restore the mill wheel to working order. Hearty kudos to all the people that helped keep this fascinating heritage centre open. 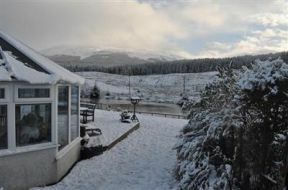 Our family had a wonderful time visiting, and the location is utterly superb. Note that because the Heritage Centre is entirely staffed by volunteers, advertised opening times may not always be accurate if no volunteers are available at that time. That's what happened to us on our last visit, when we expected the Centre to be open but a sign on the door advised us that there would be no opening that day because of volunteer shortages. Getting there is very easy. The Centre is in the Old Mill, at the north end of the Bridge of Dochart. There is very limited parking, so your best bet is to park at the free village parking area on the east side of Main Street (A827), about 200 yards from the Heritage Centre.